244882-07 Color: Putty Features: -These heavy-duty welded steel files will provide long lasting durablity to keep your valuable blueprints, drawings, artwork, maps and other flat materials neatly and safely stored. -Drawers slide smoothly on ball bearing rollers for trouble-free operation. -Centered lock system. Includes hinged paper weights in drawer fronts and hoods at rear to keep papers from curling. Container Type: -Cabinet. 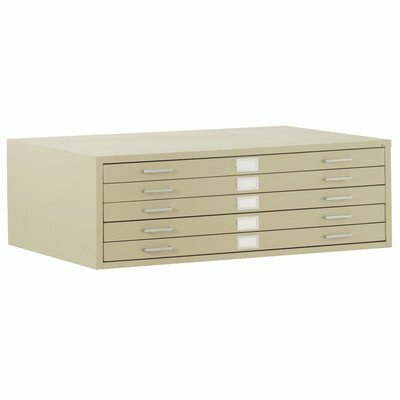 Storage Type: -Flat file. Document Size: -Oversized. Commercial Use: -Yes. Drawers Included: -Yes. Number of Drawers: -5. Locking: -Yes. Dimensions: Overall Height - Top to Bottom: -16.13". Overall Width - Side to Side: -55.75". Overall Depth - Front to Back: -41.38". Overall Product Weight: -227 lbs.